ABOUT: This lookout is much visited as it is near the start/end of the Valley of Waters and National Pass routes, but it is also one of the best enclosed valley views too, taking in Tableland on the left and part of Mount Solitary ahead. 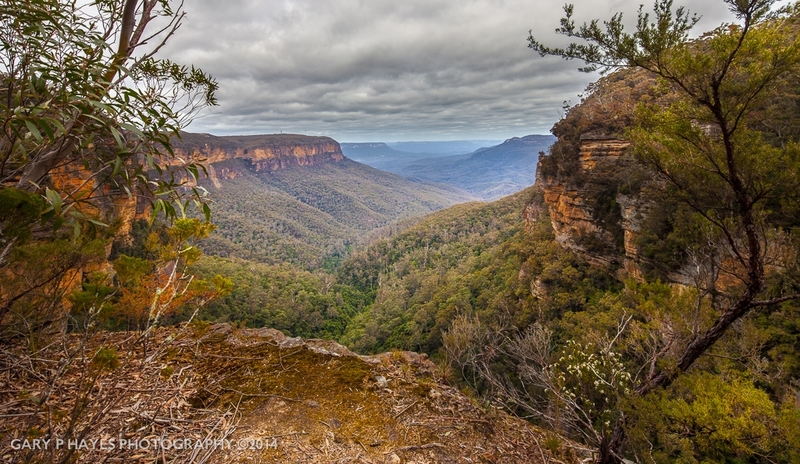 A small Govett’s Leap feel & with mist at sunrise & clouds at sunset can produce good shots. PHOTO EQUIPMENT TO BRING: A nice platform for tripods, and a small rail free area to the right. A 16mm gets full left to right coverage, but a 50mm panorama stitch works well. Also medium telephoto to shoot down the valley. GETTING TO THE SPOT/S: Park at the conservation hut and walk about 15 mins downhill, marked and easy to find.